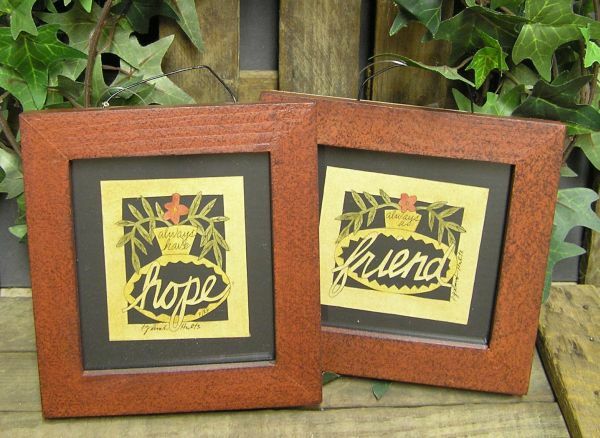 A black wooden frame surrounds this fabric item. 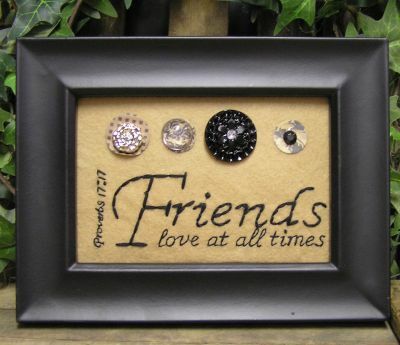 It has "Friends love at all times Proverbs 17:17" embroidered on it with 4 unique buttons along the top. There is a stand on the back so you can hang it or stand it. It measures 6 x 8 x 1. 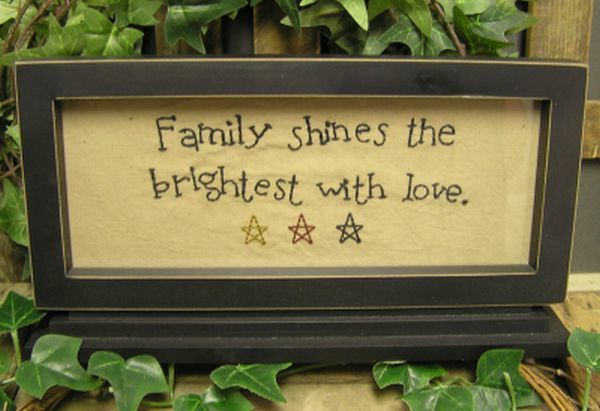 This light sign is a Manchester Cottage original hand painted design. 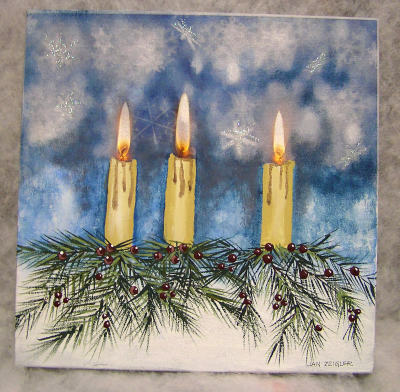 It features 3 candles that light, a greens and berry base, and blue snowflake background. It uses 2 AA batteries and has an on/off switch on the side. It measures 12 x 12 x 1 1/2. This printed canvas item features a manger scene with Mary, Joseph, Jesus in the manger, and two sheep. 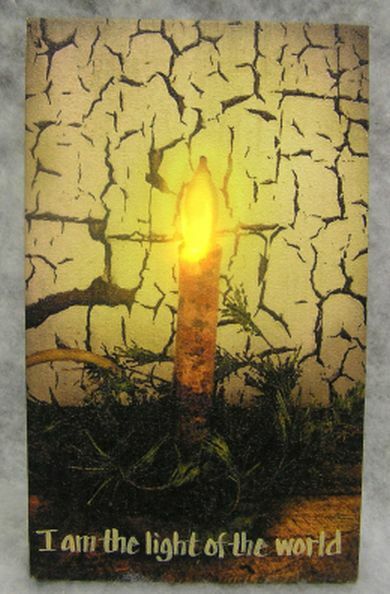 It says "SAVIOUR" along the side and has lights throughout the background. The lights use 2 AA batteries which are included. It measures 8 x 10 x 3/4. 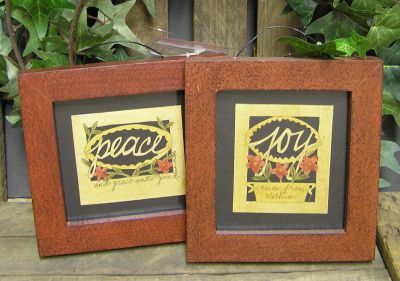 These unique framed items come in two styles: "Joy comes from within", and "Peace and grace unto you". 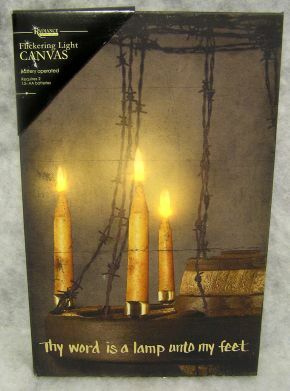 They are done in scherenschnitte (paper cutting technique) with a black matting. A wooden rod is included which can be inserted in the back to allow them to stand and they also have a wire hanger. They measure 5 x 5 x 3/4. This is a sample of what the matted prints that follow this selection look like as framed items. It is available in the cherry stain (shown) as well as a black in the same style and has a glass. The framed styles measure 14 x 17 x 1. 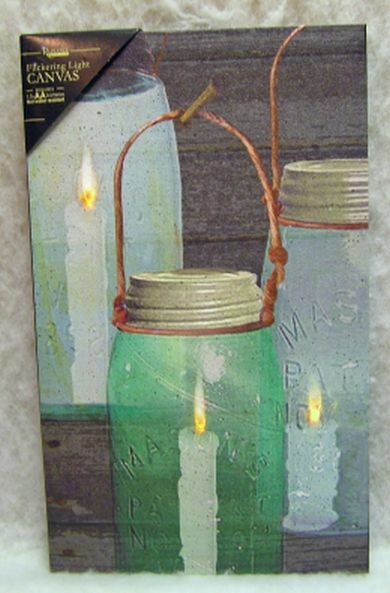 This print is unique to Manchester Cottage. 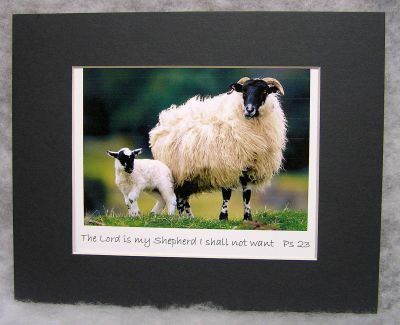 It features a sheep and lamb photo with the wording "The Lord is my Shepherd I shall not want Ps 23" along the bottom. It also has a green mat and measures 8 x 10 with mat. 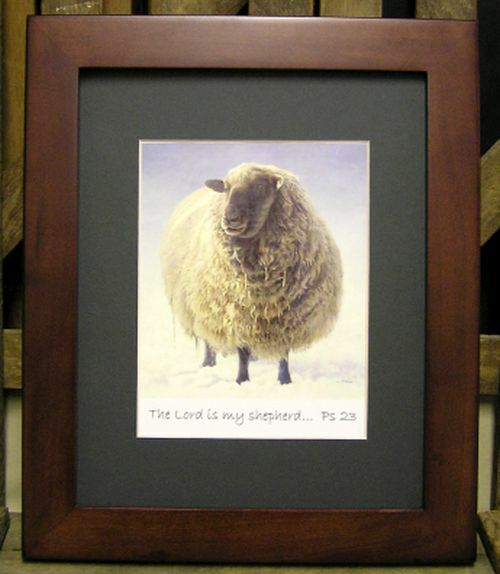 It is also available framed - check previous listing. 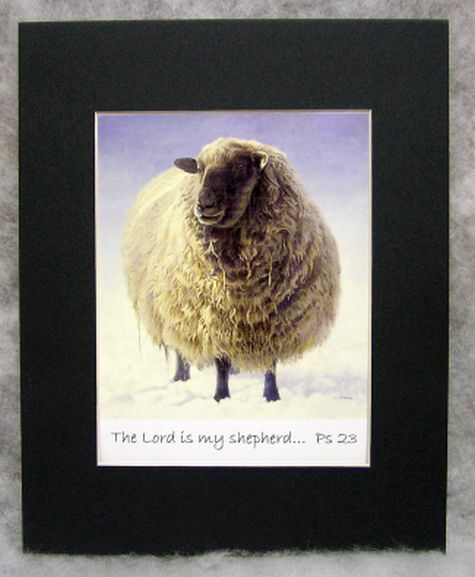 This Manchester Cottage print features a single sheep with the words "The Lord is my Shepherd...Ps 23" at the bottom. It has a green mat and measures 8 x 10 with mat. 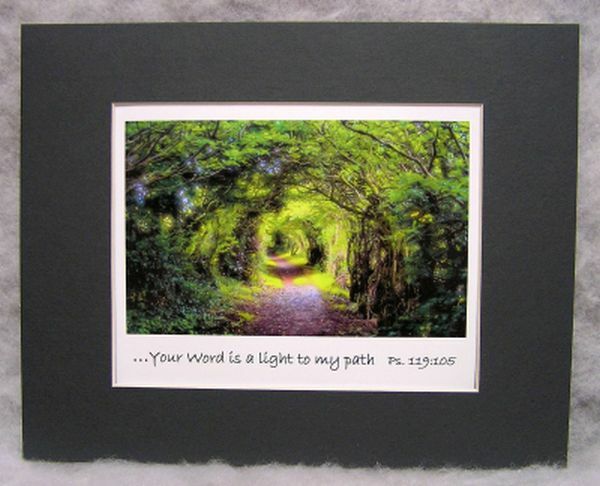 It is also available framed - look in the previous listing. 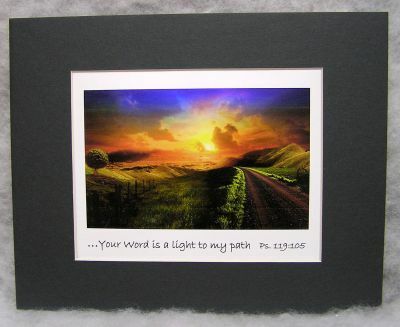 "...Your word is a light to my path Ps 119:105" is printed at the bottom of this Manchester Cottage item. It has a green mat and measures 8 x 10. 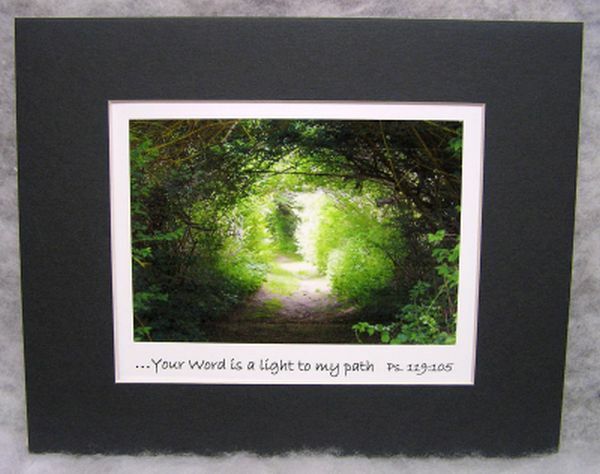 This beautiful wooded pathway print features the verse "....Your word is a light to my path Ps 119:105". 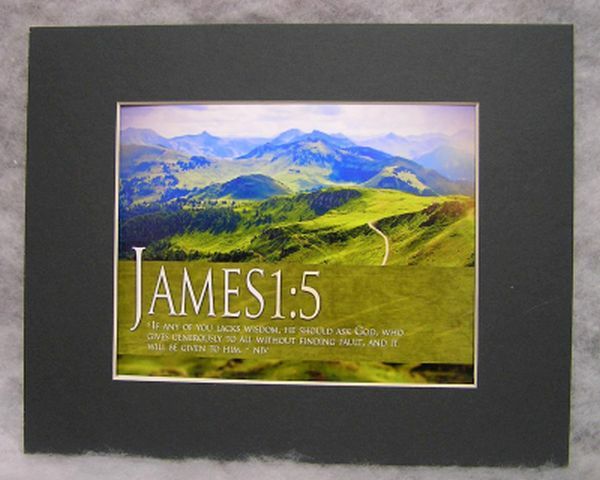 It has a green mat and measures 8 x 10 with mat. This sunset pathway print has "...Your word is a light to my path Ps 119:105" printed at the bottom. It is unique to Manchester Cottage, has a green mat, and measures 8 x 10 with mat. This beautiful print has the verse James 1:5 printed on it. The verse says "If any of you lack wisdom, he should ask God, who gives generously to all without finding fault, and it will be given to him." 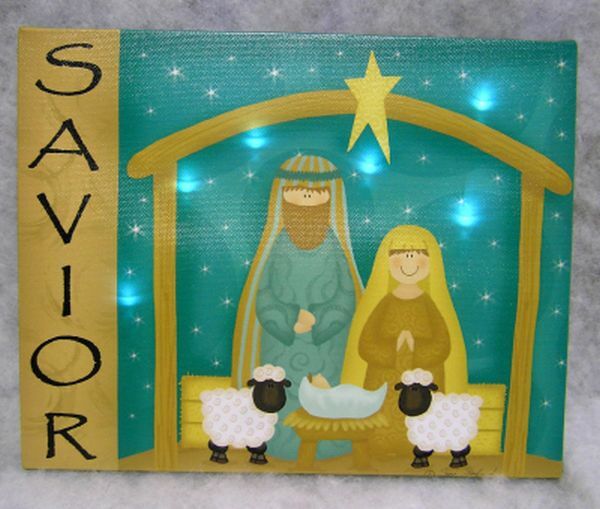 It has a green mat and measures 8 X 10 with mat. 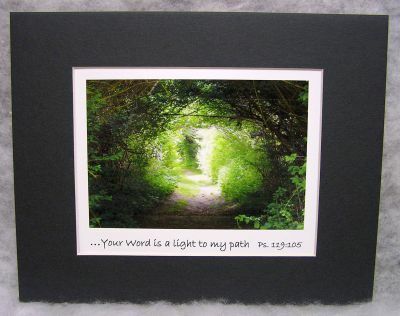 It is also available in a framed version - check previous listing.